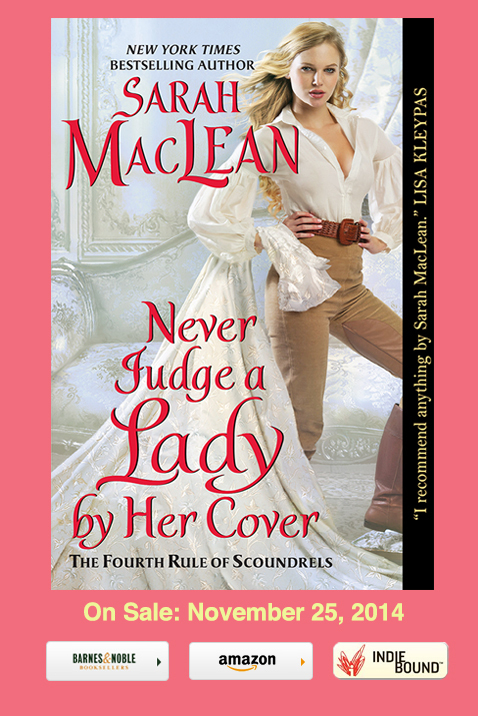 When I was offered a chance to get in on the cover reveal for Sarah MacLean's fourth and final book in the Rule of Scoundrels series, I sort of couldn't say no. This is Chase's book, you guys. Chase. And I'll admit to hoping for some time now it would be Duncan's as well. Cross-dressing and the Angel and glimpses of old friends and what in the world is going to happen and, well, all I can do is wait impatiently for November. Chase was a total jaw-dropper in that last book!! I can't wait for this one and am actually quite pleased with this cover. I quite like the cover as well.